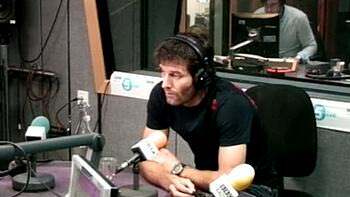 Mark Webber took to the radio this evening, spending an hour in the company of Mark Chapman on BBC Radio 5live. It was an excellent 60 minutes full of informal chat and listener questions, and Mark (the Webber one, not the Chapman one) was frank, open and honest. He talked everything from team orders, to fractured shoulders, from crashing into your teammate, to flying through the air in Valencia. Realising what an excellent opportunity this was to hear direct from the man himself, we opened up the Factbyte Factbox and followed the conversation for an hour. Hello there! This is a surprise, isn't it? That Mark Webber chap is on 5live for the next hour, and so I'll be here noting down his every word! He's already been on at the tail end of the last feature, talking about Ricky Ponting. I don't know who that is. I'll plump for cricketer. A little montage of Mark Webber moments, via the dulcet tones of Crofty's commentary. He's upside down in Valencia. "Not bad for a number two driver." Comment from RG: Oooh. Ponting is the Aussie cricket captain. So good guess. On whether he always wanted to be an F1 driver: "I used to watch endless videos, I mean, kids out there won't know what videos are... after school that was my homework. For me to be able to go out there and have a crack at operating at this level is a real highlight." On his shoulder: "I think it was a pretty quiet week newswise. Formula 1 is a sport which is hard for many people to get close to. I think the BBC have done a good job this year in trying to get people closer to the sport... access to drivers is very poor in many ways. Trying to do things, whether it's a recap of the season, which the book is, or doing this tonight, where you can give a bit back, I suppose. I did state in my book... I had a bit of a shunt off my mountain bike. People also in our sport are a bit naive, I suppose... in our sport everyone is expected to be super ultra fit and not have any niggles throughout the whole season. Which is unrealistic." He says he spent six days in a row training in the gym, and decided to go on the bike to make the most of the sunshine. His friend crashed, he had nowhere to go, and went over the handlebars. I think he might be saying the brakes are on the other side normally to wherever he was. On whether he feels he should have told Horner: "I think sometimes a little bit of information is dangerous. Christian had a lot of stuff on his plate. It's all very well to say now it would have been great to let people know. I think the best tactic was to not let anyone know. It's not like a trust, a break down in the trust of any relationships." A question from Helen in Gloucester - why did he tail off towards the end of the season? I wonder if it wasn't the fractured shoulder!! Mark says the bar was so high that finishing second seemed to be losing form. Then he says Felipe's the one who lost his form, whilst he stayed consistent. On his aims for 2011 - "I need to get in a position where I can try and race and beat Vettel as often as I can again... the reset button has been hit. We've got some new regulations to get on top of. I was in a position to do something unique, the fairy tale was there, but it didn't quite work. I've got a great team of people around me." There's been a goal at Hartlepool! Wait... what?? Oh righto. Craig on the phones now - "Can you put into words what it's like to be on the front row of the grid?" "When you're on the front row, you don't have as many references around you. The reaction to the lights is absolutely crucial... these cars accelerate so fast that if you're not reacting well, you'll make a poor start... all you've got is the clear track ahead of you so focus on the procedure and doing all those things right. You've got to focus on getting the best start possible, irrespective of the other guys around you." "The first two seconds are really important, then after that you need to get yourself into the position to defend or attack. It's the most stressful part of the race for us as we know how much is at stake." Craig asks if they think of the millions of people watching and Mark offers a resounding no. He's nervous at breakfast, driving to the circuit he gets anxious, then when he gets to the track he starts to feel better. That's Webber, not Craig, obviously. Hilary's question - "Is your chook better?" Hilary also asks when the book will be available in the UK. Mark says he'll do something but he's not really sure. Something about Amazon. Comment from Kate: Chook is aussie slang for chicken! Ah-ha! So the dog tried to eat the chicken, but the chicken is okay. I'm not sure I was expecting this when I opened up the FBFB today. I missed this guys name, but the question is basically if team orders would have been allowed. "I think it was going to be down to Seb. He knew, we both did, what had to happen at the last race. If he was in a position to take the championship away from Ferrari and bring it to Red Bull, he could well have done that. Obviously it didn't happen in the end. It wasn't heavily discussed, but I think we knew the situation. I couldn't help but he could help me if it did happen. I think for the interest of the team, it's something he would have thought heavily about." Chappers: Team orders are allowed next season. Mark: Like they never went! Comment from me: webber tweeted that he was in trouble for letting the dog get to one of them a while back. Clearly I have missed out on all the chook drama. "I think the Ferrari one was pretty brutal, and that's as bad as it gets. Obviously for the lead of the race, Fernando was all over the back of Felipe... I can completely walk a mile in the fans shoes in that one. It's not easy." Now on to teammates taking each other out. "I've had worse days. It was a tough day professionally. It's not something... we certainly didn't want it to happen. I felt a lot for the team, I really did. It's not ideal." "During that week the team gets both of us together and we sit down and talk about how we could maybe avoid that situation in the future. Both of you just giving each other a little more slack." Alan in Wolverhampton doesn't quite ask a question. Tweet from @AussieGrit: Is in the dog house with his ridgeback as dog tried to eat one of our chickens-mercy dash to vet,L story S,chook alive just, all good! Alan's second question is whether Mark can wangle him into the pitlane. Chappers laughs and says: "good effort." Now they are talking about the "not bad for a number two driver" comment. Webber says he should have sworn in it, then it wouldn't have been broadcast. He's not admitting to regretting saying it, but says he was feeling quite raw at the time. "My first victory, I did swear. I think they beeped that out. A lot of these drivers are well-educated drivers, they're not going to swear, are they?" Coming from Mark, that's quite amusing. Ooh, Mark is being filmed for some kind of Red Bull documentary for the BBC. A pause for the news. Comment from lou: ohhh! that sounds fun, following an f1 driver as a documentry.. The newsreader finishes, and Chappers ribs her for being a Mark fan, and she wants a photo. This is weird. Not how newsreaders are meant to be at all! The guy reporting on the football just said chook. They've all gone Mark mad. There are queues on the A3 southbound. Just in case you need to know. An email from Richard: "Would Red Bull be as strong if Adrian was not part of the team?" Webber: "No. Adrian is a big part of the team. He's a genius at designing F1 cars... Sometimes it takes time, you can't just wave a wand over a car. It's taken three or four years with us. He's a legend. If anyone should be knighted..."
Tom on the phones: "When you compare the way you guys drive these days to when the cars didn't have any technology on, how does it feel to drive the cars now, and to what extent does that distract from driving in the more conventional way." "If Fangio drove one of our cars, he would do the same job as we are. Our cars are very, very violent. The braking capabilities are phenomenal. We know these cars are faster, but that doesn't mean we are better drivers. We need to be as precise as they were. The cars were a little bit more lazy and gave them more feedback. But if those guys made a mistake, they would die. In terms of how we go about driving the car, it's very similar, albeit the laptimes very similar." I think... essentially... compare driving now to driving then! A clip of Crofty shrieking at the Valencia crash. Sounds scary just from the audio. Kevin in Chester: "What were the thoughts going through your head when that car was upside down?" "Unbelievable. Very frightening, not a good position to be in at all. F1 cars are meant to stay on the deck. It happened very fast, and a strong part of my car had a big impact with his rear tyre and I went up in the air. At that point I was worried about bridges... if I make any contact with something up there, anything can happen. The cars are designed for impact on the ground... when you're up there, a lot of the testing goes in the bin because you're very exposed. Not a great feeling at all. Lucky to get back on the ground. I actually snapped the brake pedal clean in half." Chappers asks if it was more scary getting knocked off a mountain bike. Webber says he knew he was okay after Valencia, but after the bike incident he knew he wasn't okay. Kieran in Fife: "I'm 14 years old and me and my dad bought a kart. We haven't started racing yet, we haven't got that much money, I know you had struggles with money and sponsorship - do you have any advice?" "It's a very difficult sport in that sense... you've got to take each season as it comes. You know you've got a set budget, you've got to do the best you can with that. Race and get some experience. If you've got not as much money, you need to try to get in some races against some tough guys so you'll get noticed quicker." That may not be 100% accurate, I was distracted because Webber said Kieran should thank his dad after every single race. Bless. "Until you get sponsored or someone to believe in you, someone needs to foot that bill." John - "If you could drive for any F1 team in history, which one?" "I think Ferrari. Every single driver has an attachment to them." I missed this guy's name, Mark, maybe? Or am I just thinking of Webber. Anyway, the question is something about the team not being fair: "Was there any point you thought I'm going to have to go elsewhere?" "I never thought about going somewhere else. I knew I had to sort things out within our own operations." He adds that, as he's said many times, Red Bull had a lot of lessons to learn that McLaren and Ferrari and the like have already been through. "It's a technical sport and we have 500 people that work for us. I drive the car, everyone walks away from the car on the grid, then it's over to me. Obviously there is interaction with team members during the Grand Prix, but it's all down to me... I celebrate a lot of things on my own but the team is never far away and I need the team to get the results." Question - What's it like driving against Michael again? "He's a phenomenal driver. We know he doesn't give anything on the track and that's to be admired in some respects and some people aren't a big fan of that. You can still compete without being that brutal all the time. I have a good relationship with Michael, he's a different competitor at the moment. He's enjoying it a bit more, he's a bit less intense." Paul - Bernie is taking F1 to different parts of the world, a lot of the places are not well-attended and the tracks aren't as good. Do you feel money is taking over before the excitement of the race? He couldn't be more Australian. "Unfortunately the infrastructure, the paddocks, they got so small now, so Bernie wants all these big new venues built. Sometimes we do the driver parade and we think, we're waving to the marshals, there's no-one here. It is a bit bizarre for us. Eventually, the races will get traction. We're starting to see it in the middle east." Paul wants two Belgian GPs, Webber does not sound so keen. Hartlepool are 3-2 up. Honestly. Even Chappers sounds annoyed. Carl - What would you do to change the rules to make it even more competitive? "I don't think the sport can get any more competitive than it is, in terms of how close the times are. In terms of making it more interesting to watch, a big, big reduction in downforce. Laptimes would increase severely. Increase the horsepower. Have the cars a little more on a knife-edge. Downforce, basically. The braking markers could become shorter. Downforce is the biggest area that needs addressing." Giles - Is there a particular Grand Prix which you like to race at each year? Webber: "Monaco is unique, dramatic. Also, Spa is an incredible venue." Controversially, Giles is asking another question! Is moving into TV something you would consider, like Coulthard? Webber: "They would struggle to understand me, wouldn't they? We'll see. Long way to go." Chappers says hedonistic, and Webber has to ask for a dictionary. "The world has changed in terms of what you can and can't do, and perceptions of people, the media spotlight has changed now." Someone has texted in to tell Webber to sit up straight. Apparently he's got a bad back. Ooh, quick fire. He likes vegemite. Monaco was his favourite. Ideal teammate is Senna. Scrap one rule? Thinking, thinking, restricted tyres. More: Webber drinks Red Bull but before the race it's isotonic yucky stuff. I might have added the yucky. Would you swap with Jason Crump? Webber calls him Crumpy, but says no. Webber's car insurance is high. His motorbike cover even more so. Play racing games? A little bit. How can you support Sunderland? A lot of words I don't understand, but I think he's saying he likes managers. Can you read the pitboards? Yes. Sam has the final question - One year left on your Red Bull contract, what are your plans in 2012? "Take each year as it comes. I'm really focusing on the next race. Contract time always comes around and you're either wanted or you're not. I still need to want to do it. Last year went well for me, I hope I can do the same this year. What's really important is that you finish on top of your game." That's it. Yay for Mark. Chappers finishes with: "Good luck next year. Bad luck with the cricket." Tweet from @NobleF1: What a top bloke @aussiegrit was tonight on Radio 5.